I’ve reported on some advancements in building blocks before, such as the MUJI kits that blend hard paper with Lego bricks. Here is a new development for building blocks that I’ve never seen before, but really should have. You know those terrific castles that your kids build out of blocks, the type that constantly fall over? Well, imagine if there was a way to lock the blocks together. I’m not talking about Lego, which uses those bumpy things, but magnets. Yes, the Tegu is designed to lock together magnetically, so they have a little more resilience than your typical wooden blocks. I can’t imagine the Tegu structures being too solid, but it is a lot better than just gravity. Best of all, the shapes of the blocks are more than just rectangles, but cubes and flat pieces for some very creative models that you can see in the picture. If you want it, the Tegu kits come in the three forms. 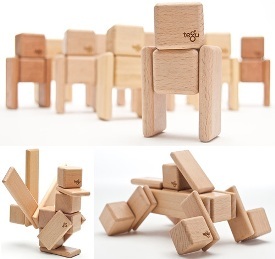 The first is the Starter Set with 26 blocks in 3 shapes which include cubes, long planks, and short planks. The Original Set has 52 blocks in 4 shapes, and adds long planks. As for the Limited Edition Mahogany Set, it’s a bigger one. The prices of these are $50, $85, and $125, respectively.